Again this year, Jean Coutu joins Rythme and Clarins to support the CHU Sainte-Justine Foundation. 13 years of hugs… and support! The CHU Sainte-Justine Foundation has raised close to 4 million dollars and financed a number of projects focused on the health of children and their parents since the very first Mois des Câlins. 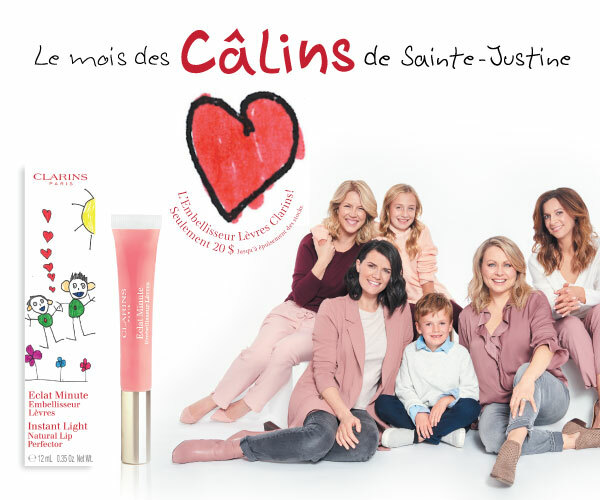 Now you can contribute by purchasing a Clarins “Rose Câlins” Lip Perfector, sold exclusively at Jean Coutu stores in Québec. For every product, $10 will automatically be donated to the Foundation. An ultra-comfortable texture, a slightly rose hue and a vanilla shea scent, Clarins’ "Rose Câlins" Lip Perfector has something for everyone. Its moisturizing formula will treat your lips gently, whatever the season. The Lip Perfector box is adorned with a very special illustration: the winning design from the latest Dessine-moi un câlin (Draw me a hug) contest! Created by 11 year-old Adam, this year’s design was selected from more than 1000 entries. The 2019 edition of the contest ends on February 15th so hurry and send in your best hug! Funds raised during the 2019 Mois de Câlins will go to the Marie Enfant Rehabilitation Center (CERC) of CHU Sainte-Justine. The only center in Québec dedicated exclusively to pediatric rehabilitation, the CERC is a leader in Canada. Each year, it welcomes 5,000 children and teenagers from all over the province who have motor or language impairment. A few of its clinics also treat young people with intellectual disabilities and autism spectrum disorder. The young CERC patients receive highly specialized adaptation-rehabilitation and social-participation services to help them develop their abilities, maximize their autonomy and acquire essential skills for daily living. Rehabilitation interventions and tools are tailored to the specific needs of children and families to help to increase their potential for integration into society and participation in an active life, both personally and professionally.